Jeannius is a Privilege 435 (now called the 445) constructed by Alliaura Marine and launched October 14th 2002. We were lucky enough to be able to visit the factory several times during construction and record the progress with these photographs. Just a few weeks later we started the delivery journey across the Bay of Biscay, to Portugal and on to the Canary Isles. From the Canaries we took part in the Atlantic Rally for Cruisers arriving in St Lucia after a wonderful 17 day crossing that we will never forget. 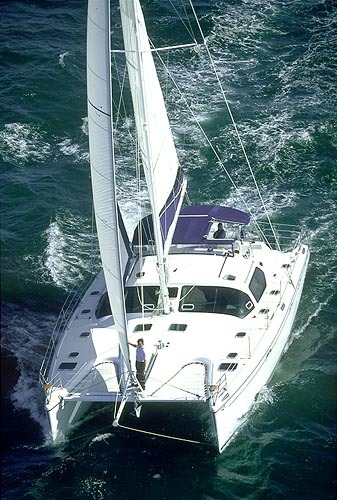 Privilege catamarans are probably the best appointed of all production catamarans. There are only about 40 boats built a year across the entire Privilege range and they sell for a much higher price than the average catamaran. The interior furniture is all beech veneer and the wall coverings a hessia n-like material. 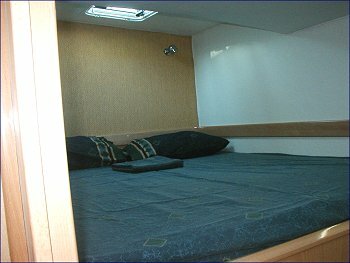 Jeannius’ 4 double cabins all have air conditioning and the beds are all of equal size (6’7” X 5’ 3”). There is ample cupboard and wardrobe space in each cabin and 110v electrical outle ts. Each has an en-suite head with the aft cabins having access from the companionway. Click on the drawing to see a larger image of the layout. The cockpit area is a particular feature. It is large enough to seat 8 people for outside dining and sun screens keep the area nice and shady although they can be rolled up if you want to fry!